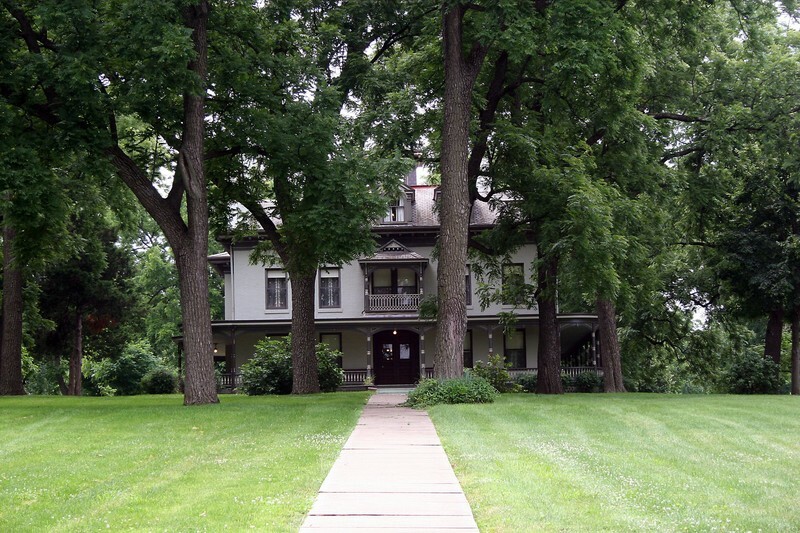 A real treasure can be found in Independence, Missouri just a few blocks south of Independence Square. Standing on 19 acres of land crossed by the pioneers heading down the Santa Fe Trail stands the Bingham-Waggoner home surrounded by its beautiful outbuildings of great architectural beauty. The house was built in 1852 with hand made bricks in the Italianate Villa style by John Lewis, a saddle maker who had a lucrative business near the town square furnishing the needs for pioneer travelers. A real treasure can be found in Independence, Missouri just a few blocks south of Independence Square. Standing on 19 acres of land crossed by the pioneers heading down the Santa Fe Trail stands the Bingham-Waggoner home surrounded by its beautiful outbuildings of great architectural beauty. The house was built in 1852 with hand made bricks in the Italianate Villa style by John Lewis, a saddle maker who had a lucrative business near the town square furnishing the needs for pioneer travelers. A six-room brick house was only available for those more fortunate at that time and this one boasted a fireplace in every room and gas lighting. John Lewis lived in the house for six years. In 1864 the house was again on the market and was purchased by Missouri genre and portrait artist George Caleb Bingham who resided in the house for six years before moving into Kansas City to follow his other love, politics. Bingham built a studio on the front lawn of the Estate, now gone, where many of his paintings came to life including the most famous of his political creations "Martial Law", better known as "Order Number 11". "Order Number 11" was Bingham's statement against the Union Army of their very controversial method of freeing slaves in this area. Finally, in 1879 the house changed hands for the last time. A prominent miller from Pennsylvania heard that Independence was a fine place to live and rear a family. William Waggoner purchased the house and his flourmill across the street served the area for many years to come with a variety of flours, the most famous being "Queen of the Pantry". William and his wife Elizabeth decided to enlarge the house to better accommodate their growing family and improve their lifestyle as prominent residents. In 1895 to 1899 the house grew from 6 to 26 rooms and went up to three stories. The house was modernized with an intercom system of speaking tubes and electricity. In 1925 steam heat was added throughout the house, as well as craftsman style lights in the dining room. Also, at the time of remodeling, a carriage house, stable, chicken/farrowing house, double outhouse and a smokehouse were built on the west side of the Estate. These outbuildings are of great beauty topped with cupolas to follow through the design of the cupola on the main house. A cupola was the "attic fan" of the day, designed to draw hot air up and out of the buildings.